The devil is in the details. That's a lesson you learn fast when you go on your first interview and quickly realize your "best" business accessories are anything but. Up to that point, resume portfolios probably didn't mean much. But in the business world, whether you're at the office, a work function or a black-tie dinner, your professional image matters. Create a lasting impression with a VERSATILE and STYLISH leather zippered portfolio from Forevermore. Combining a both sophisticated and utilitarian design that will help make any business meeting more complete. This synthetic leather portfolio/ padfolio is both flexible and durable enough to hold countless documents, 3-ring notebook papers, legal pads, and folders, while still maintaining its professional, business profile. Perfect gift for corporate executives, lawyers, seasoned professionals, recent college graduates, or ambitious interviewees and sales professionals looking to seal the deal. In addition, our well-crafted leather portfolios are environmentally-friendly and animal-friendly. That means no animals were harmed in the making of your new exquisite leather writing accessory. Not only is this portfolio grand, it's also low maintenance, easy to clean, and doesn't fade in the sun or crack with use. We stand by our writing portfolios and guarantee that you will too! Say goodbye to messy legal pads and walk into your next meeting in style with Forevermore leather writing pads and portfolios! Our beautiful, sophisticated leather writing pads (padfolios) and portfolios protect your important documents, giving your work the respect it deserves. 100% SATISFACTION GUARANTEED!!! If in any case you are not satisfied with your padfolio, you can get a full refund within 30 days. Click Add to Cart button to claim your new PORTFOLIO today. PERFECT BUSINESS GIFT Looking for a gift for a work colleague, business client, or a recent college graduate? Look no further. This sophisticated leather portfolio makes the perfect gift! VERSATILE & PROFESSIONAL DESIGN Want to make a lasting impression during an interview or on the job? 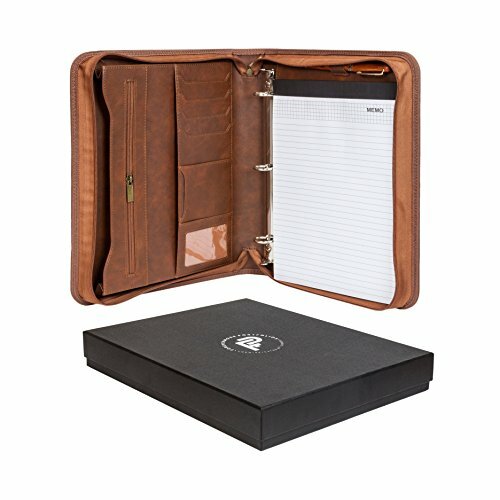 With a sophisticated, yet stylish design and spacious interior, this zippered leather portfolio with a removable 3 ring binder is perfect for carrying business cards, documents, three ring hole punched notebooks/ notebook paper/ folders, tablets/ iPads, your writing utensil, and any other office supplies you need on the go. Latest design by Forevermore. MADE TO LAST WITH PREMIUM DURABILITY Made of environmentally-friendly synthetic leather. That means no animals were harmed in the making of our timeless business portfolios, while also providing portfolio owners with many years of low-maintenance use. REMOVABLE 3-RING BINDER & NOTEPAD INCLUDED Fits 8.5 by 11 inch letter size notepads and three (3) ring hole punched notebooks, folder, and notebook paper. 100% MONEY BACK GUARANTEE We stand by our product. If in any case you are not satisfied with your portfolio, you can get a full refund within 30 days. View More In Padfolio Ring Binders. If you have any questions about this product by Forevermore, contact us by completing and submitting the form below. If you are looking for a specif part number, please include it with your message.